I’m a senior pastor, minister, conference speaker, church consultant ... and in every avenue I work in a common need I find is more transparency. Some of my favorite moments are when I’ve been brought in as a guest of honor and then share my current struggles. It gives permission for honesty, relationship, and the need for God as a human in process while also walking in honor and responsibility. Leading up to being ordained in 2003 I had never witnessed a pastor blatantly share a current weakness with me. These moments were always shared as “I used to...” implying they had arrived and overcome. This was limiting for my development process because it subvertly created the pressure to also have a status of arrival as I began my ministry. It also created a culture that says if you are struggling something might be wrong with you, or you might be disqualified. Church leader culture: If you have a weakness, you’re marginalized. If you fail, you’re done. With all the movements today, weaknesses are getting exposed at a heightened level. Things that happened many years ago are causing people to not just be out, but to be done. Many Christians I know are upset with political correctness, upset that forgiveness isn’t exercised with second or third chances. But I wonder if the culture of the church of “fail and done” has been the pioneer of the PC movement? I ponder if the way we have crucified the failed leader has set this tone in the earth? And then... I wonder what could be possible in the church to shift all of culture through demonstrating radical restoration and reconciliation? Every choice we make can shake the earth! I’ve seen affairs, crazy addictions, murder, and abuse overcome. I think about what the church would look like if we asked Jesus how much restoration was too much? What length would He go to reconcile? What effort would He give to bring honor back and believe in someone’s future after failure? You can’t read the Bible and not be blown away at how God consistently used broken, weak, unhealthy people to do great exploits. What if justice (getting what you deserve) was a short season? *Haven’t we proved as a society that separation doesn’t equal rehabilitation? * What if that was then followed by blatant mercy (not getting what you deserve) which was then followed up by a season of grace (getting what you don’t deserve)! What if the end goal of restoration is giving something to someone that they aren’t worthy of? And what if this supernatural gift is the final encounter of healing? 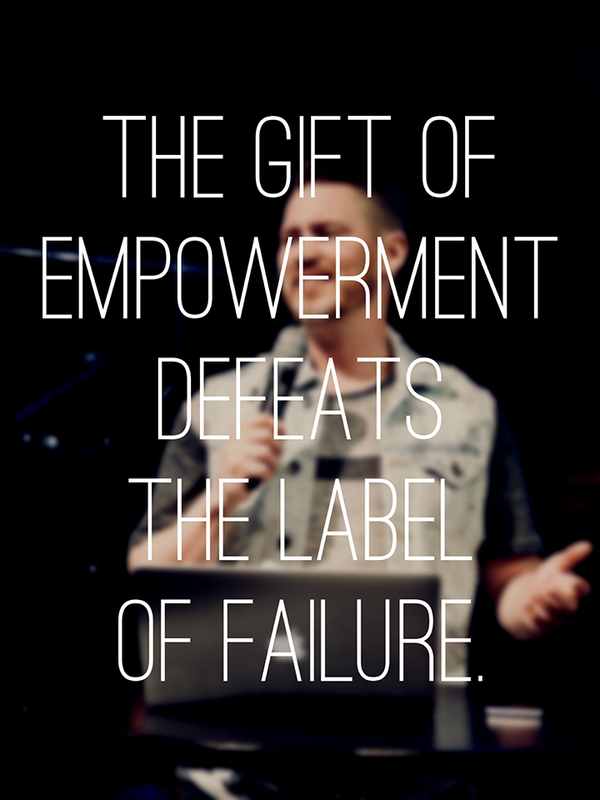 The gift of empowerment defeats the label of failure.